Wetlands are transitional areas between land and water. Wetlands are saturated with water or covered by shallow water at least part of most years. Only specially adapted plants can thrive in these wet, saturated soil conditions. Wetlands include, but not limited to, swamps, marshes, bogs, prairie potholes, sloughs, and wetland fringe adjacent to streams. Less obvious wetlands may only hold water for a few weeks in the spring. The U. S. Environmental Protection Agency and the U.S. Army Corps of Engineers provide a more technical definition for wetlands they regulate Federal, state and local authorities regulate wetlands. As a public works agency, NDDOT must obtain appropriate approvals and permits from regulatory agencies when projects will have unavoidable adverse impacts to wetlands. The goal of the Wetlands Program is to ensure that wetland and water resources are accurately identified during project development and that appropriate measures are taken to avoid and minimize impacts whenever feasible, then compensate if needed. Web soil survey provides soil data and information provided by the National Cooperative Soil Survey. NRCS has soil maps and data available online for more than 95 percent of the nation's counties and anticipates having 100 percent in the future. Developing and establishing mitigation banks provide an efficient and effective way to offset unavoidable natural resource impacts, improve environmental compliance efforts, and create ecologically sustainable mitigation and conservation projects. The banking program allows NDDOT to efficiently mitigate for unavoidable wetland and natural resource impacts from highway construction and maintenance projects. Ensuring banking program projects optimize mitigation investment by addressing ecological priorities on a watershed and landscape level and implementing long-term protection, stewardship and adaptive management for bank sites. 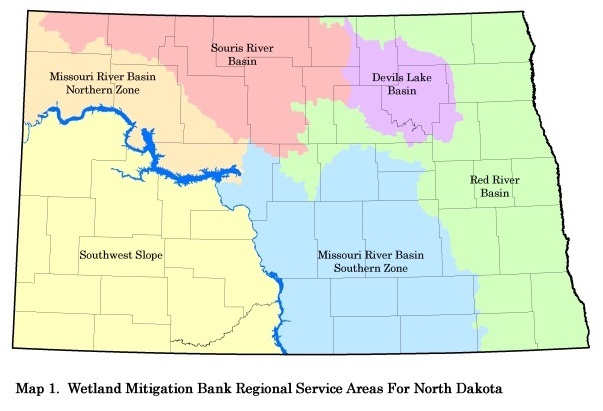 North Dakota is divided into six Resource Service Areas (RSA) for USACE jurisdictional wetland mitigation purposes. RSAs define the maximum geographic applicability for wetland mitigation banks in North Dakota. Following are the RSAs located in North Dakota. Contains a collection of reoccurring plan sheets and notes. NDDOT CADD Standards and associated resource files.